Dominica is getting a boost to its manufacturing sector and it’s green product movement through Nature Island Paper Products Inc. The company began manufacturing a high quality, biodegradable toilet tissue in Dominica in September 2010. Now, nearly five months on, they have worked out some of the kinks in the production and distribution and they believe they have a superior product at a very competitive price. 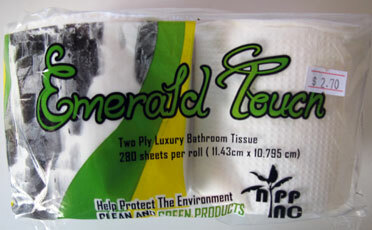 The product line currently features Emerald Touch and Soft Falls toilet tissue. NIPP hopes to move into paper towels, facial tissue and paper napkins in the near future. They plan to continue this theme of naming their products to reflect Dominica’s natural attractions. You can find Emerald Touch and Falls Soft in most local supermarkets, pharmacies and shops. NIPP is running an introductory offer of just EC $1 per roll. Contact them at their location in Canefield (see below) to take advanatge of this offer or to place an order. Deliveries in the Roseau vicinity are free of charge. What makes Emerald Touch a green product? These days there are many factors that contribute to a product’s green rating. Cutting down on imports, providing jobs for local Dominicans, and creating a product that is highly biodegradable all add to the “greeness” of this new product. And NIPP’s motto Help Protect the Environment – Clean and Green Products leads us to believe that more green products are on the way. Let’s Buy Local and support Dominica’s economy ~ and enjoy a quality, more environmentally friendly product.